The guzheng, a zither-like traditional Chinese instrument, dates back almost more than 2,500 years. Its popularity was first documented in the Qin Dynasty, around 200 BC. Although its presence is firmly rooted in Chinese history and culture, the guzheng remains a fairly rare instrument played mostly in conservatories in China today. Qin Jun, a Massachusetts resident and master guzheng player, began playing this ancient instrument when she was only eight years old. By the age of fourteen, she was enrolled in the SiChuan Conservatory of Music, where she majored in guzheng. After graduating from the Conseratory with high honors in 1988, Qin Jun spent many years teaching in China, touring throughout Europe and Asia, and performing across the United States. 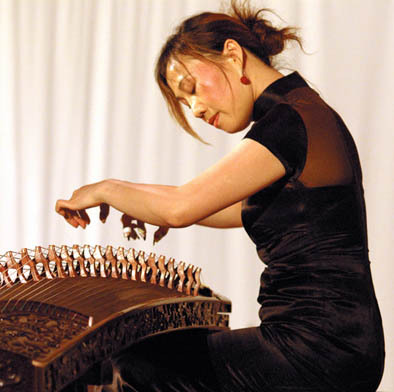 In 1999, she settled in Boston, where she now teaches guzheng. As a little girl growing up in Vietnam, Virginia Payne always admired the tranquil, fluid sounds of the ancient guzheng. Although she aspired to be a guzheng player all of her life, it was virtually impossible to find a teacher in Saigon. When Payne moved to Boston as an adult, she watched Jun Qin perform in a concert at Harvard. Determined to finally learn the instrument, she began taking lessons with the guzheng master soon after. Very early on in her lessons, Qin Jun recognized Payne's natural talent and her ambition to excel in this ancient music form. The pair was awarded a MCC Traditional Arts Apprenticeship grant 2003.